We present an ab-initio real-time based computational approach to nonlinear optical properties in Condensed Matter systems. The equation of motions, and in particular the coupling of the electrons with the external electric field, are derived from the Berry phase formulation of the dynamical polarization. The zero-field Hamiltonian includes crystal local field effects and the renormalization of the independent particle energy levels by correlation effects. We also discuss the possibility of accurately treating excitonic effects by adding a screened Hartree-Fock self-energy operator. The approach is validated by calculating the second-harmonic generation of SiC and AlAs bulk semiconductors: an excellent agreement is obtained with existing ab-initio calculations from response theory in frequency domain. 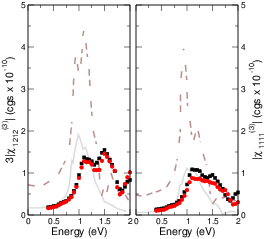 We finally show applications to the second-harmonic generation of CdTe and the third-harmonic generation of Si. 1). Virk and Sipe presented an approach based on non-equilibrium Green’s function and a global gauge transformation to deal with the external field, I found this paper quite difficult to read. 2) The strategy of Springborg and Kirtman was to optimized the phase of the Bloch functions and use the velocity gauge. Altought the idea sounds good, I think it is implementation in a plane wave code with a lot of conduction bands and in more than one dimension is very complicated. 3) Then there are the approaches based on TDDFT and velocity gauge . Even if the seems very appealing the forgot the phase factor in front of the wave-function where there is the position operator that cannot be treated in a simple way. Disregarding this factor only the linear response is correct see refernces . However they have one point stronger than our approach, the fact that they included the coupling with the Maxwell equations. The same criticism is valid for the approached based on Kadanoff-Baym equations in velocity gauge. Souza, I., Íniguez, J., & Vanderbilt, D. (2004). . Physical Review B, 69(8), 085106. Virk, K. S., & Sipe, J. E. (2007). . Physical Review B, 76(3), 035213. Springborg, M., & Kirtman, B. (2008). . Physical Review B, 77(4), 045102. Real-space, real-time method for the dielectric function. Bertsch, G. F., Iwata, J. I., Rubio, A., & Yabana, K. (2000). Physical Review B, 62(12), 7998. Equivalence of interaction Hamiltonians in the electric dipole approximation. Rzązewski, K., & Boyd, R. W. (2004). Journal of modern optics, 51(8), 1137-1147. Matter-field interaction in atomic physics and quantum optics. Lamb Jr, W. E., Schlicher, R. R., & Scully, M. O. (1987). Physical Review A, 36, 2763-2772.